The Edward Hopper House Museum & Study Center is pleased to present Boy in A Room, a site-specific installation by Claudia Alvarez. Renowned for her ceramic figures of children imbued with adult-like characteristics, Alvarez’s work engages such timeless subjects as immigration, violence, social isolation, youth and aging. Often situated in unexpected or ambiguous settings—forlorn and seeking reassurance in an empty room; armless and stranded on swings; or naked and fighting one another—these child-figures evoke the fearful and aggressive behaviors of the adults they mimic. ​Inspired by Hopper’s paintings and family home, Alvarez has created an extraordinary new series of works for this exhibition: figures of children that resemble Edward Hopper himself. As Alvarez describes it, she has “reimagined the painter inside a familiar space, the house where he grew up…the place of early awareness that fostered his ideas.” Finding a variety of childhood themes and spatial compositions to explore within the Hopper House, Alvarez also references particular pictures by Hopper to suggest the “psychology of his interiors” and “the interiority of the individuals” he portrays. The house’s domestic setting and the play of light were key to Alvarez’s concept, as are the poses of the figures and where they are located. Seated on a bed or standing by a window, these sculptures recall Hopper’s images of starkly lit rooms with solitary figures. In this way, Alvarez has envisioned an installation that simultaneously portrays Hopper as both child/adult and artist/model. This merging of traits suggests how we take childhood experiences with us into adult life—as Hopper did, so clearly in his art—and the ways in which we are both subjects and narrators of our own stories. The exhibition also includes a series of watercolors and drawings by Alvarez that were inspired by Edward Hopper’s ink on paper drawing, Little Boy Looking at the Sea. Titled First Landscape, the series invites viewers to imagine how they might see themselves in the world for the first time. Alvarez says that these works represent her reflections on the painter’s childhood drawings, further noting that “at an early age Hopper closely observed and made pictures of his surroundings. How can I imagine him and his creative mind at that time and throughout his life into old age?” Alvarez also uses images of children in nature as a pictorial metaphor for the beginning of one’s life in the world, and on a more personal level, drawing is a favored medium for exploring memories of her own childhood as well. Born in Monterrey, Mexico in 1969 and raised in California from the age of three, Alvarez received a BA from the University of California, Davis in 1999 and an MFA from California College of Arts, San Francisco in 2003. She worked at the University of California Davis Medical Center in Sacramento, California, from 1987-2000 and while there was deeply affected by the terminally ill children and elderly patients she encountered as a non-emergency ambulance driver. Her painted and sculpted figures continue to reflect the strength and vulnerability of children. Alvarez’s pictures and sculptures have been exhibited in the United States, Canada, Europe, Mexico, and Japan. Her work has appeared in journals such as New American Paintings, The Irish Times, Art Pulse, NY Arts Magazine, Review Magazine, Ceramics Monthly, Ceramics: Art and Perception, and in the book by Judith Schwartz, Confrontational Ceramics. Collections include National Museum of Mexican Art, Chicago, Museo de Arte Contemporaneo de Yucatan, Merida, Mexico; Sheldon Museum of Art, Lincoln, Nebraska; El Museo Latino, Omaha, Nebraska; and Whitespace: The Mordes Collection West Palm Beach, Florida. 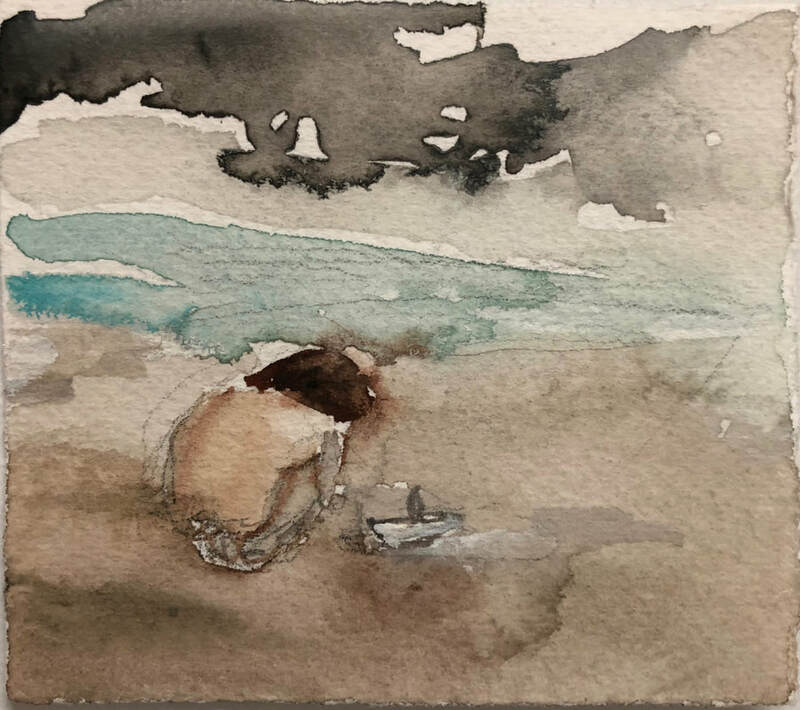 Claudia Alvarez "Near the Sea" 2018, Graphite and watercolor on paper, 3" x 3 1/2"
In addition to Claudia Alvarez’ Boy In A Room installation, which will be on exhibit at the Edward Hopper House beginning June 8, the artist will also be releasing a series of watercolor paintings and drawings keeping with the theme of Edward Hopper’s childhood. Alvarez was inspired by Hopper’s ink on paper drawings such as Little Boy Looking at the Sea to create her own artwork. After viewing early pieces of Hopper’s work, Alvarez felt inclined to reflect on her own childhood and her surroundings reminiscent of Hopper’s own material. 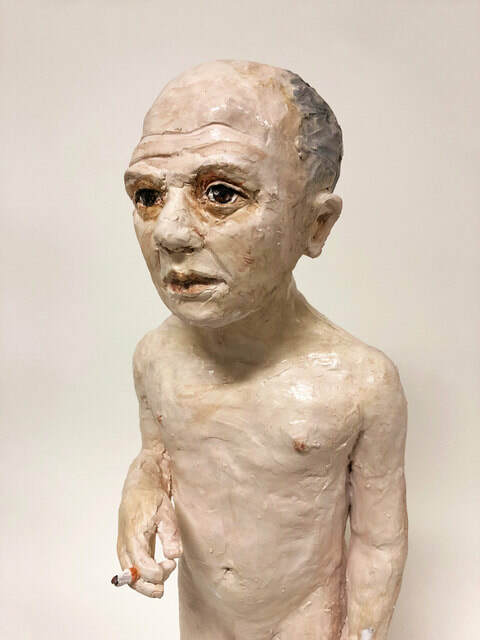 Claudia Alvarez, Boy in a Room, 2018, Glazed ceramic, 19 x 11 x 15 in. Claudia Alvarez, Smoker, 2018, Glazed Ceramics, 28 x 10 x 9 in.